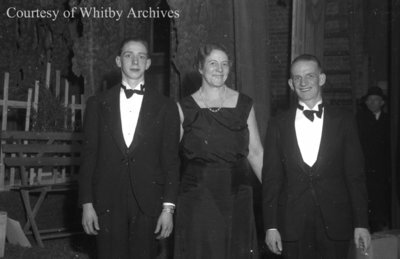 A black and white negative of three performers dressed in formal attire at the minstrel show organized by the All Saints' Anglican Young People's Association (AYPA) in December of 1939. In this view from left to right: unidentified male, unidentified female and unidentified male. This negative has started to degrade. All Saints AYPA Minstrel Show, December 1939, Marjorie Ruddy. Whitby Archives A2013_040_683C.